Art and design don’t always have to be serious, so we’ve sought out some artists and architects who inject a high level of playfulness into their work and installations, many of which redefine the way people feel and interact with their urban environment. 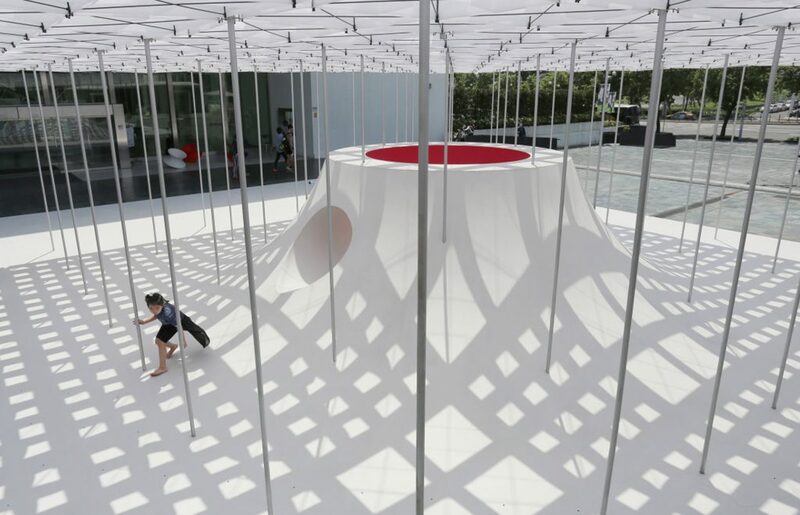 Shen Ting Tseng architects in Taipei, Taiwan designed this site–specific Floating Pavilion as a temporary installation on a windswept, subtropical and sun–drenched museum plaza. The work totally transformed the (previously unused) civic space to create a completely usable, spatial experience that also inspired playfulness and exploration. Brooklyn based artist Mark Reigelman challenges typical urban settings by creating site-specific public works injected with vibrancy and playfulness. 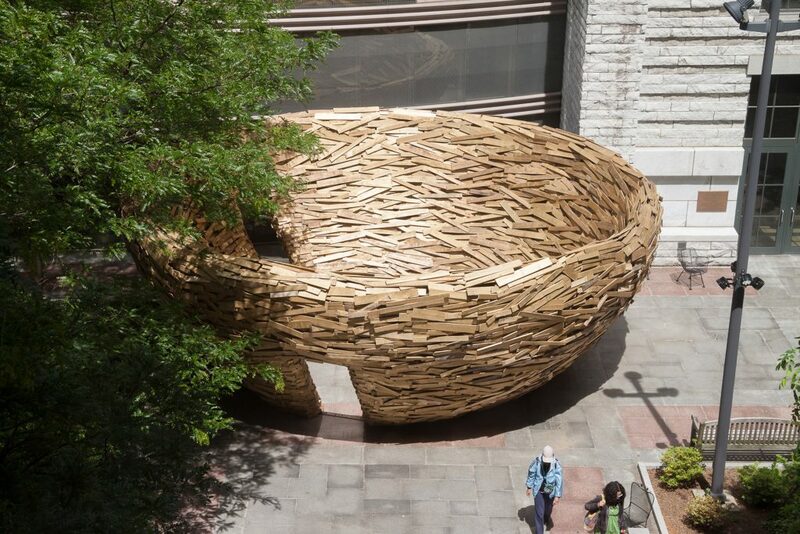 Projects such as his recent Domino Park Sweetwater playscape, which cleverly pays homage to the site’s historic sugar factory, or the huge Cleveland Bird Nest (above), made from 10,000 discarded wooden boards, resulting from the meticulous research of existing architecture, public interaction and civic history. At the same time, Reigelman says he always aims to celebrate the human condition in the metropolitan landscape. 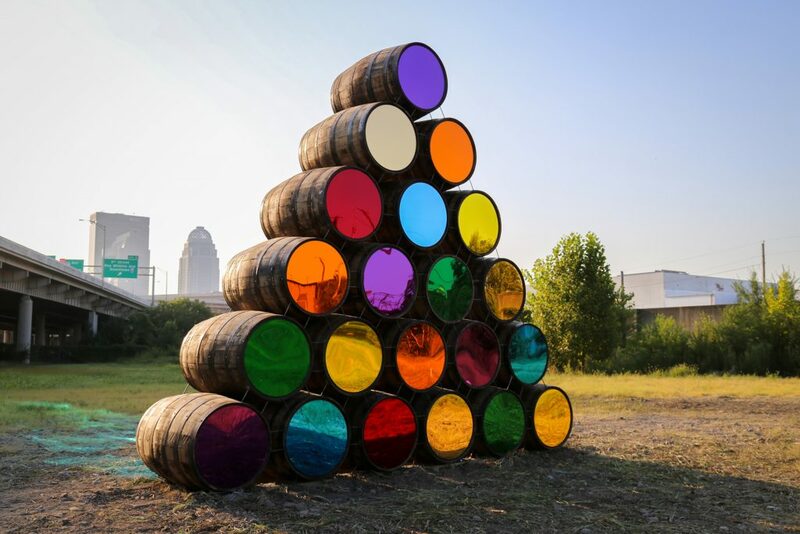 His Upriver/Downriver installation consisted of mountainscape of salvaged wooden barrels fitted with sleek, saturated mirrored surfaces set on the port side of the Louisville Ohio river. The sculpture drew on the historical relevance of barrel use on this 18th-century trade route when they were used to stow the personal belongings of early settlers as they made their way across America. Meanwhile, this playful concept actually has a very serious location. Korean designer Soyoun Kim has conceived an ambitious project for the border between North and South Korea. The Blue Neutralised Zone is an optimistic plan for a series of 25 pavilions and playscape’s set along the peninsula, in the hope of transforming the border from a symbol of conflict to a symbol of peace using structures that visitors from both sides can experience to re-establish their common history and culture.